Note: There are two (2) roads running north/south on the Outer Banks…the "Beach Road" (NC 12), and what is known as the"Bypass" (US 158). Between the Roads - These properties are located in the wide area between NC12 (Beach Road) and US 158 (Bypass). Access to the beach is via a public beach access. Some properties are within walking distance to the beach, others will require a very short drive. Fronts the Beach Road - The beach road is the two lane road that runs parallel to the ocean. The speed limit is 35 MPH on the beach road. From Kitty Hawk thru South Nags Head, these properties are located on the WEST side of the beach road. There are no homes between the property and the beach road. These homes may or may not have direct beach access. Semi-Oceanfront - Semi-oceanfront homes are located one lot back from the ocean and may or may not require crossing the road. Children always will need assistance to cross any road. The distance to the water, beach accesses, and views vary. Oceanside - These homes are located east of the "Beach Road" (Route 12) and there are no primary/major roads to cross. These homes have two or more homes between them and the ocean. These homes may or may not have an ocean view and the distance to the ocean varies. 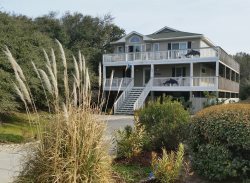 Soundside - These homes are located west of Highway 158 from Southern Shores to Nags Head and west of Highway 12 from Southern Shores to Corolla. The distance to the sound and views vary. Homes may not have direct access to the sound. Pack-n-Play - An enclosed play yard for play and nap. Portacrib (portable crib) - A fold away crib with a thin mattress. Pyramid Bunk - Bunk set with a double on the bottom and a twin on the top. Trundle - Bed that stores under another. Dune deck - An oceanfront sitting area. Game room or rec room -Room which may include amenities such as a pool table, foosball, ping pong, etc. Half bath - Bathroom with a toilet only (no bathtub or shower). Hall bath - Bathroom that is only accessible from the hallway. Heated private pool - A private pool that may be heated for an additional feel; see individual property descriptions for cost and availability dates. Hot tub - A water-filled wood, plastic, or ceramic manufactured tub. Normally equipped with a heater that heats the water from 80 to 106 degrees Fahrenheit. It may also have jets to bubble the water; typically located outside. Private pool -A private swimming pool located at the rental property. Semi-private bath - Bathroom with two (2) entries; one from a bedroom and one from a hall or another room. Shared bath - Bathroom that is situated between two (2) bedrooms that is accessible by both. Special Events - Any event that will increase the occupancy of the home - even for just a few hours. Special Event homes can be reserved for an additional fee & security deposit. Guests must call our office to reserve a Special Event home. You can also email [email protected]. Theater/media room - Separate room with large-screen TV, multiple speakers and adequate seating for multiple viewers. Whirlpool - A bathtub with jets. WiFi (Wireless Internet) - Internet access that allows users of personal and hand-held computers to connect to the internet at high speed without cables.